The best summer days start warm and bright and you never want them to end. This summer, you couldn’t blame boatbuilders for hoping the season itself would linger, prolonging a rally that began in the heat of July and continued in August. For the second month in a row, new-boat sales rose by double-digit percentages in the main powerboat segments and industrywide, helping builders continue a recovery from the effects of a cold, wet spring. 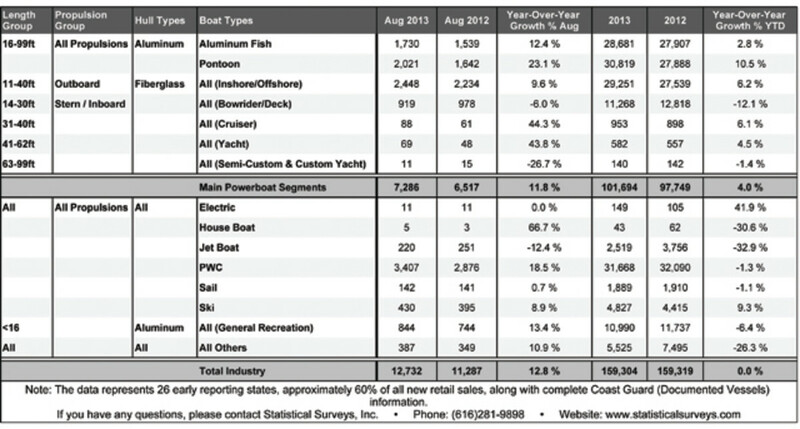 Led by aluminum pontoon and fishing boats and outboard fiberglass boats, sales in the main segments rose 11.8 percent in August, or 769 boats, to 7,286, from the same month in 2012 in 26 early-reporting states representing about 60 percent of the U.S. market, according to figures compiled by Statistical Surveys. Statistical Surveys national marine sales manager Ryan Kloppe said the August report is further evidence of a boating season that bloomed late because summer weather was slow to arrive in many parts of the country. “With no spring, people who wanted to buy a boat waited until it got warm and then went out and bought one,” he said. Pontoon sales climbed 23.1 percent in August to 2,021 boats, giving the consistently popular category the highest percentage increase of any of the industry’s high-volume segments. Sales of aluminum fishing boats gained 12.4 percent, or 191, to 1,730, and sales of outboard fiberglass boats from 11 to 40 feet rose 9.6 percent, or 214, to 2,448. Sales of 14- to 30-foot inboard and sterndrive fiberglass boats bucked the trend and continued to struggle. The segment saw sales fall 6 percent in August, or 59 boats, to 919. Industrywide sales in the 26 states totaled 12,732, an increase of 12.8 percent, or 1,445 boats, from August 2012. Warm-weather states Florida and Texas were the best performers, reporting 1,989 and 1,977 sales, respectively, but Michigan ranked third with 922. California (856), North Carolina and New York (both with 657), Georgia (643), South Carolina (532), New Jersey (466) and Tennessee (445) rounded out the top 10 in sales for the month. With 24 states and nearly half of the market yet to report, the industry has a chance to surpass its 50-state total for August 2012, when 17,984 boats were sold as the market continued a year-long recovery from the Great Recession. Sales of 31- to 40-foot cruisers rose by 27 in August this year to 88 and sales of 41- to 62-foot yachts climbed by 21 to 69. Sales in the largest size category — custom and semicustom 63- to 99-foot yachts — fell by four to 11. The Coast Guard was up to date in August on its reports of documented vessels, so the sales figures for boats larger than 31 feet were complete. Sales of personal watercraft surged, rising by 18.5 percent, to 3,407 units, and ski-boat sales gained 8.9 percent to 430. Sailboat sales rose by a single boat to 142. For the year through August in the early-reporting states, sales were up 4 percent from a year earlier in the main segments, or 3,945 boats, at 101,694, and they were essentially flat industrywide — down 15 boats at 159,304. Kloppe said he was pleased to see that overall sales have overcome the effects of the poor spring and caught up to their 2012 pace. “Now we’ll see whether we can get some gains in the next few months,” he said.